Sussex Head Coach Mark Davis has offered reassurance to the sides battling for promotion from Division Two of the County Championship as his side prepare to host Nottinghamshire at Hove. Notts will be promoted if they avoid defeat but if Sussex win then Northamptonshire could sneak into second place with victory over Leicestershire while leaders Worcestershire will also be hoping for a strong Sussex performance as they prepare to play Durham. Sussex blew their own chances of going up when they lost successive games to Northants and Derbyshire earlier this month, but Davis was impressed with the character they showed last week when a young side, led for the first time by Luke Wells, beat Durham to claim their seventh win of the season. Davis said: “It’s great for us that we are going into the last game with something on it. “They beat us at Trent Bridge earlier in the season so it would be good to set the record straight. Wells scored a century and impressed against Durham with his quiet, thoughtful leadership. He could reprise the role against Notts if Ben Brown is again ruled out with a back injury. Sussex will make a decision on his fitness after training on Sunday. “I said to the guys afterwards that I may have to retire after one game – it might not get any better than that!” said Wells. A side strain will rule out Ollie Robinson so Jofra Archer is expected to return after he was rested last week. 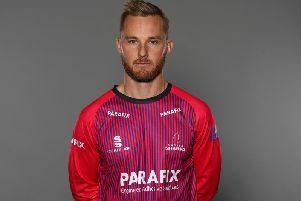 Archer has taken 57 Championship wickets and a good finish could see him overtake Worcestershire’s Joe Leach (63) and Liam Norwell (58) of Gloucestershire and finish as the leading wicket-taker in Division Two. - Nottinghamshire have won their last three against Sussex, the last time either side went on a longer winning streak in the history of this fixture was when Sussex won eight in a row in the 1960s. - Only one of Sussex’s last nine home games have ended in a draw (W4, L4). - Chris Read has a league high 50 dismissals this season, all of them catches. - Nottinghamshire have lost two games in a row, the last time they lost three in succession in Division Two was in 2001.